Happy hump day everyone! 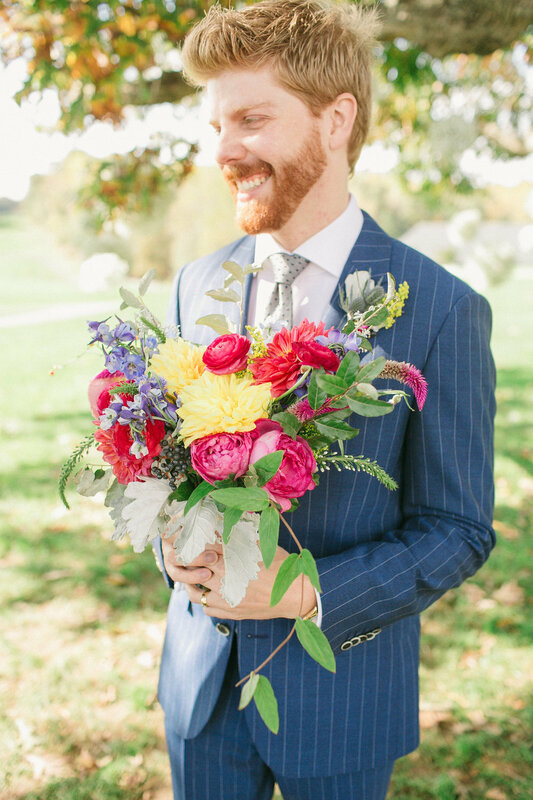 To get you through the rest of the week I've decided to share a recent wedding that will make you long for the weekend to get here even faster! It was our first brunch wedding and I have to say, I wish I had attended this wedding because everyone was so kind from the guests to the manager and staff, the food looked amazing...chicken and waffles, eggs Benedict, and the weather was cool and breezy, just perfect for a wedding day in the Fall. This Colorado couple came all the way back to her home town to tie the knot and to be with family. You could tell there was a lot of love in the room that day. 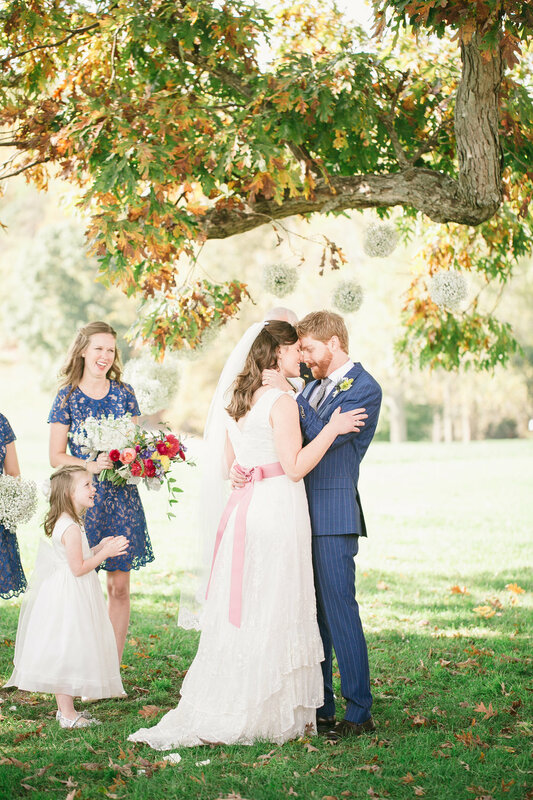 Maggie & Sean had their ceremony under a huge oak tree on the Boonsboro Country Club front lawn. We hung twenty... that's right, TWENTY Kissing balls from the massive tree that became the background for their nuptials. It was really stunning when it was all done. Props to Beth, Maggie's mom, for the idea. All the white was really simple and beautiful with moments of color pops that would delightfully catch you off guard and keep you guessing when you'd see more. Thanks to We are the Mitchells for the amazing detail shots and for being so quick with getting these to us. I feel like Sean has a Damian Lewis' little brother vibe going on...maybe I've just been watching too much Homeland lately. Maggie's bouquet is filled with dusty miller, various pink garden roses, lysmachia, blue virburnum berry, dahlias, fuchsia celosia, blue delphenium, mardi gra solidago, ranunculus, cornflower, kochia, and foraged vine, wild olive, and bittersweet. Baby's breath kissing balls hung from the Oak tree. Groomsmen boutonniere of dusty miller, blue thistle, snowberry, and blue virburnum berry wrapped in ivory silk ribbon. All white stock bouquet with dusty miller. 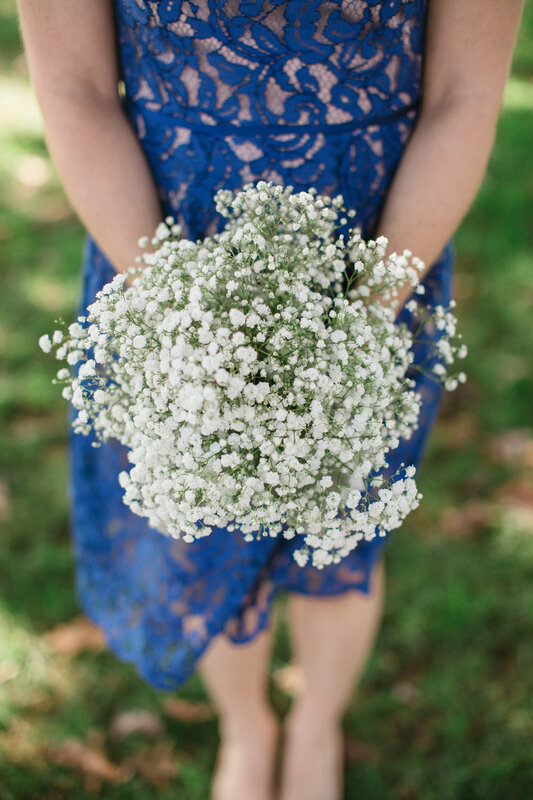 All white baby's breath with dusty miller.